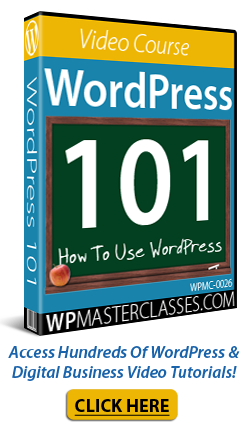 This tutorial was created using an earlier version of WordPress and may contain outdated information. Please bookmark this page as we will be updating this tutorial soon! To be notified of updates to our content, subscribe to our updates list (see sidebar), or Like our Facebook page. 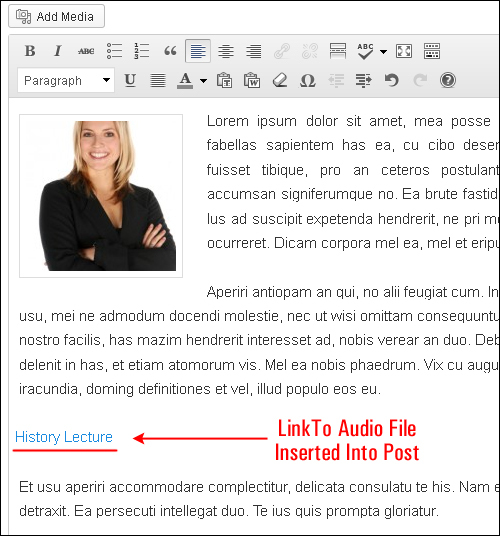 As well as adding text, images, and videos into your content, you can also insert audio files into your WordPress posts and pages. This lets your visitors listen to (and/or download) audio-based content such as interviews, song previews, narrated articles, podcasts, lectures, seminars, classes and more. 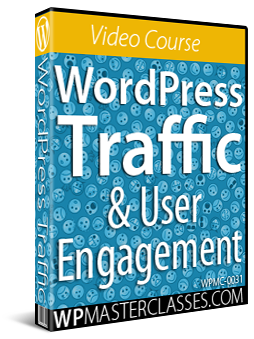 It also helps your site to engage better with your visitors and keeps them longer on your pages. 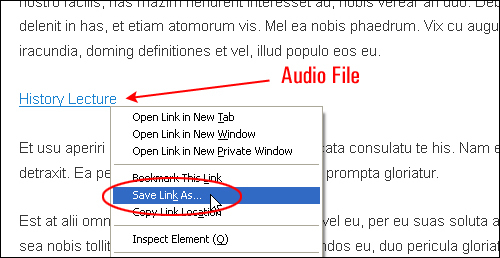 You can add downloadable audio files to your WordPress site, or you can embed an audio player that lets your visitors listen to audio files while on your site … or both! 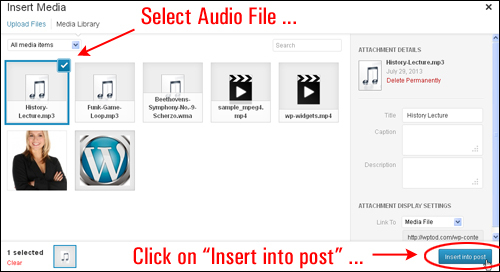 Complete the step-by-step tutorial below to learn how to add audio files to WordPress. 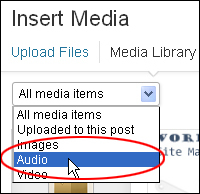 The WordPress Media Library lets you add audio files to your site. In earlier versions (e.g. v 3.5) WordPress did not come with a default media player for playing audio files. If you are using an earlier version of WordPress, then search online and you will find a number of plugins that allow you to embed audio files into WordPress. Refer to the section further below where we go through some of these plugins. 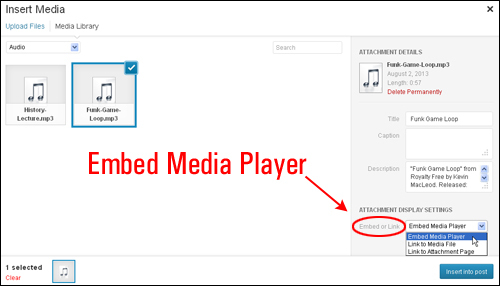 For now, let’s take a look at how to upload an MP3 audio file in WordPress using the default WordPress Media Uploader and then go through the process of embedding the audio file into a WordPress post or page using a simple plugin and a neat feature of WordPress called oEmbed. oEmbed allows you to autoembed certain files into a post or page (e.g. 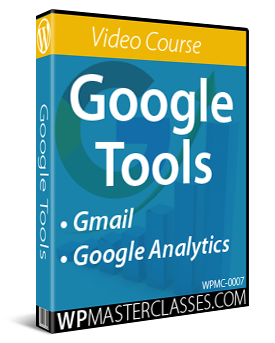 a YouTube video) simply by adding the URL in a line of its own with no hyperlinks (i.e. the URL should not be clickable when viewing the post). You will need this URL later. For now, just minimize the text file and move onto the next step. 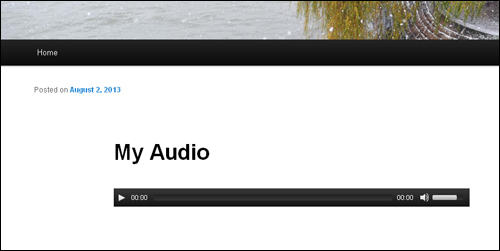 The next step is to download, install and activate a WordPress plugin called oEmbed HTML5 audio. This plugin converts URLs of audio files (MP3, OGG, WAV) into HTML5 audio and embeds it into posts and pages using the oEmbed technology that is used by WordPress. Audio files are embeded using HTML5 audio tag, with a Flash-based backup player for MP3 format for browsers that don’t support either HTML5 or MP3 format. Note: make sure that you select all of the line where you have added your markers. 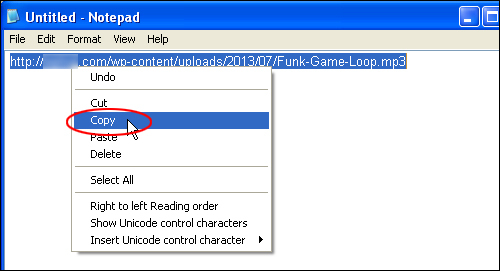 The audio URL must be placed in its own separate line with no surrounding characters. This also includes no hyperlinks! 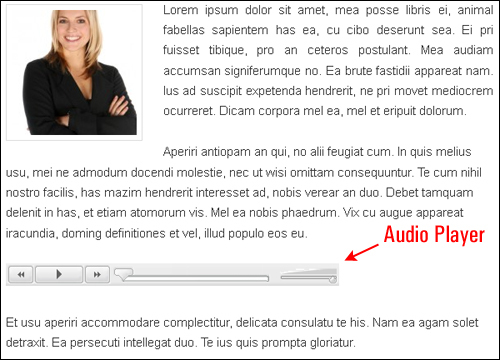 Note: Depending on the browser type and version used by your visitors, your audio player might display differently. Below are screenshots of the same audio player viewed on different browsers. Notes: If the browser does not support the HTML5 and/or the MP3 format, then a Flash based audio player will be used instead. The flash fallback method seems to work fine for most internet browsers and platforms. With CP Media Player you can publish files in the following formats: MP4, OGG, WebM, WMV, MP3, WAV, WMA and WebSRT subtitle files. This plugin is based on MediaElement.js which guarantees support for all browsers that implement the HTML5 standard. For older browsers, it supports Flash and Silverlight. CP Media Player also allows you to associate a playlist to your media player and change the look of the player to match the design of your site as closely as possible. Compact WordPress Audio Player plugin is an HTML5+ Flash hybrid based WordPress plugin that can be used to embed an mp3 audio file into your WordPress post or page using a shortcode. The plugin adds a compact audio player that will play on all major browsers, and supports .mp3 and .ogg file formats. 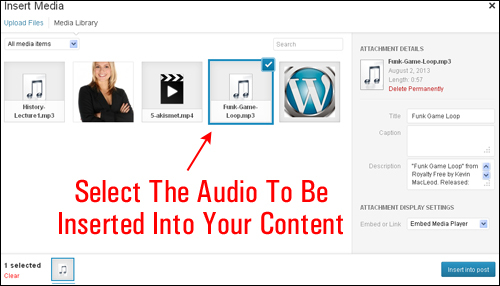 The audio files that you embed into your posts and pages using this plugin will work on all devices. This compact and responsive audio plugin for WordPress supports .mp3 and .ogg file formats and works on all browsers and devices. 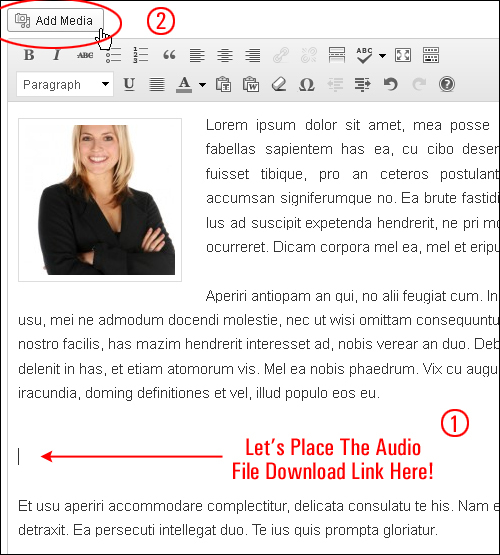 You can add audio files and audio previews to your WordPress posts and pages using a shortcode. This plugin lets you add essential features for podcasting to WordPress and offers full iTunes support, web audio/video media players, and more. You can browse additional audio plugins for WordPress here. 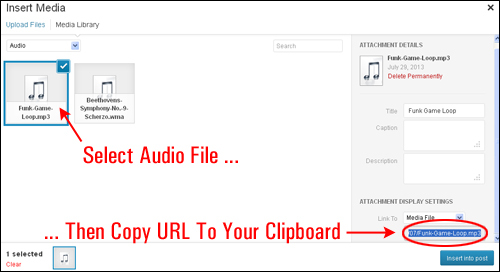 Tip #2: You can store your audio files on a remote server (e.g. 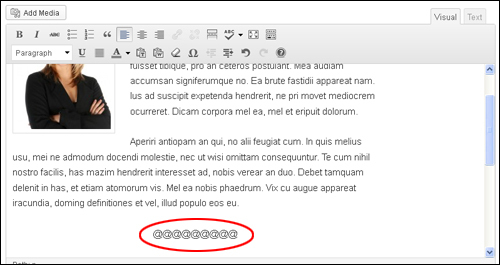 Amazon S3) as .zip files and create graphic “download” buttons instead of using direct links to your media files. 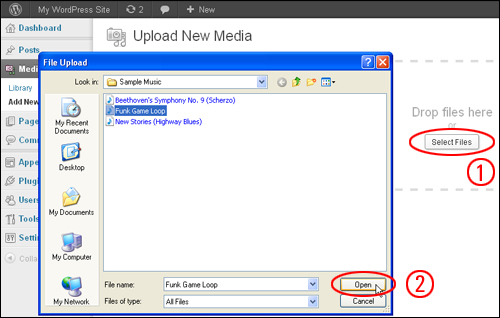 Tip #3: Adding direct links to media files does not allow you to monitor information about your downloads. 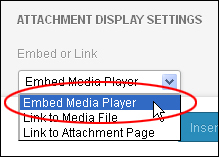 Some mobile platforms may not display certain video and audio players. 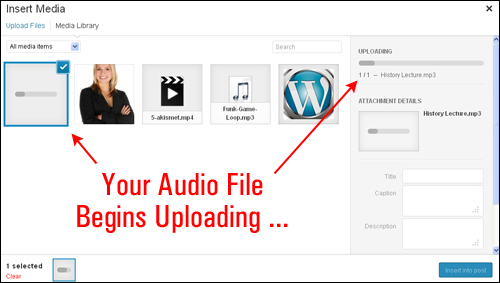 Uploading your audio files to your own server using the WordPress Media Uploader is fine, but it can lead to your bandwidth being consumed very quickly if your audio becomes popular. For example, if the size of your audio file is 10MB and 1,000 people listen to it, that’s 10 GB of bandwidth being consumed. If you plan to add a lot of media to your WordPress site (e.g. videos and audios), a better solution is to upload your files to a remote storage location such as Dropbox or Amazon S3, then simply copy the links of the files and paste these into your posts. SoundCloud is like a YouTube for audio files. 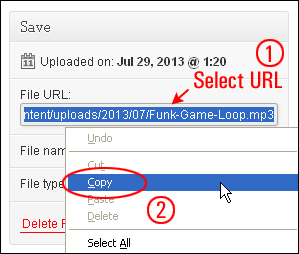 You can upload your audios to your SoundCloud account and then embed your files as single files or entire sets (e.g. a lecture series). Congratulations! 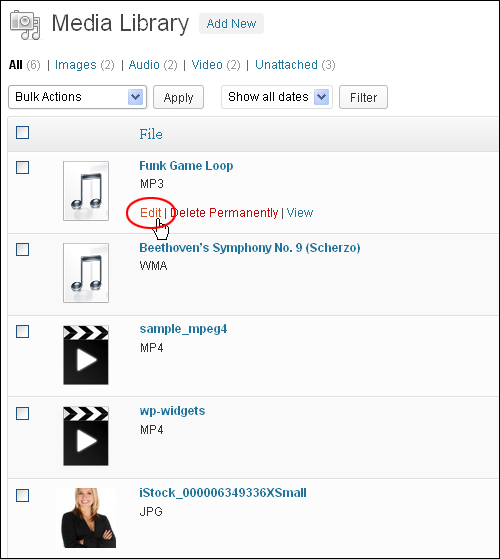 Now you know how to add audios to WordPress.